I began this journey well over 3 years ago, but arrived here in Port Moresby on the 18th August 2011, 3 very short years ago. Over the past 3 years, I think I have answered a few thousand emails from people wanting to move to PNG, met lots of people via my blog, and I think it’s fair to say, generally given people a balanced viewpoint on living and working here in Port Moresby. Some people that have contacted me through my blog have become our lifelong friends, our family. Moving here with a young family has meant that we have watched our children and our friends children all grow up together, and as some of our friends depart these shores to parts and places all around the world, we know that in the future we will meet again. Our children will always have wantok’s no matter where they go, and the world becomes a much smaller place. When we arrived here, my little one was 1 year old. She doesn’t remember living in NZ and Papua New Guinea is her home. We go “on holiday” to New Zealand, which must be amazing for a little girl. She doesn’t “see” race, or skin colour, and she is happy with the little things she has. My big kids need more, but they are now more in tune with the effects of poverty and hardship than they ever could be back in NZ, and I hope that when they grow up they will take a lot of the life skills they have learned here in PNG and turn them to do good in the future. And although this might be the end of our 3 year contract, it isn’t the end of our journey here in Port Moresby. My company has extended my contract for another 3 years, which really sounds like a lifetime away now. As the older children transition into High School, we may have to reassess if things don’t work out, but we are still here, still trying to make a difference, and still helping new people and families with the information and tools that they need when they move here to PNG. Sadly though, we have watched many of our friends depart. Some have finished contracts, some have had other opportunities, a lot are finishing up this year. It is sad knowing that your support group is leaving, but I am sure that those voids will be filled by other families, and our close bonds will get closer. We have experienced amazing things; just 2 weeks ago, Xanthe (our eldest) had a week long school camp at Tufi Dive Resort. 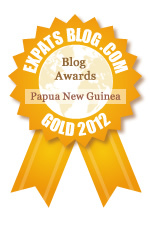 Last year it was Kokopo and Rabaul… Awesome memories! We have had some real highs, (Kokopo was a high) and some real lows (being stuck in the middle of a bush knife fight), but we have never really regretted the decision to come here. a young team, to one that could easily perform on the world stage. We are onto our 3rd High Commissioner (maybe there is a job there for me one day – not! ), and back home in NZ we are about to have another general election (the 2nd since leaving). Our home back in Dunedin is onto its 2nd lot of tenants, and the place might needed to be painted this year – it is hard having a rental back in NZ, and if I did it all over again, I would have sold the property so that would be one less thing to worry about. We’ve also had some fantastic holidays, not just back to New Zealand, but also here in PNG, to Singapore, Australia, and Vanuatu. Next year we may go a little further and take the children to Disneyland whilst we are all together. We never bought a boat here, and for some reason don’t get invited out that much, however – with 3 kids, it can be hard for others to invite such a big family… If I was to move up again, I would have thrown a couple of jetski’s into the container – much cheaper back home than here. But we are Ok with the time we get to go out, and of course are very grateful when we do. I have some pretty cool ideas to take the next step with my blog, and have been doing some video’s that I intend to upload to YouTube so hopefully I can get that going soon. But until that happens, there is plenty of work, Bedisloe Cup watching with the Kiwi Club, and the bi-annual Kiwi Club ball is coming up in October. There’s always plenty of parties – sometimes too many, we’d love to catch them all, but it can be hard. And there is the annual trip back to NZ for Christmas coming up soon. Jacinta and the kids get out for the entire school holidays as it is a little boring, but also damn hot here in Moresby. As I turn another chapter over, I would like to thank everyone for commenting on my blog, and making it into the resource it is. There was nothing like this when I moved up here, and I trust that the information and insight into PNG and Port Moresby really does help. Again, if you see us out and about, please stop us for a quick Hi! We really appreciate knowing that we helped in your decision to make a difference here in Papua New Guinea.